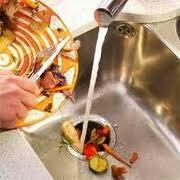 Do you ever think twice before disposing items down your drain? Well, you should. When running small errands at home we often get distracted and don't even realize the harm we are doing by what we rinse down the kitchen sink, bath and shower drains, and even what we flush down the toilet. In a study published in 2002, the U.S. Geological Survey (USGS) collected and analyzed water samples from 139 streams in 30 states in order to measure concentrations of 95 wastewater-related organic chemicals in water. One or more of these chemicals were found in 80 percent of the streams sampled. Half of the streams contained seven or more of these chemicals, and about one-third of the streams contained 10 or more of these chemicals. Most chemicals found in the study come from pharmaceutical products, which means you can do a lot for the environment by simply not flushing prescriptions. All cat litter, including those advertised as "flushable"
Following these simple guidelines before disposing items down the drain or toilet, you will help the environment, your neighbors and yourself. If you are not sure about how you can dispose specific items and you have any questions, please contact your management team and they will provide you with additional information.